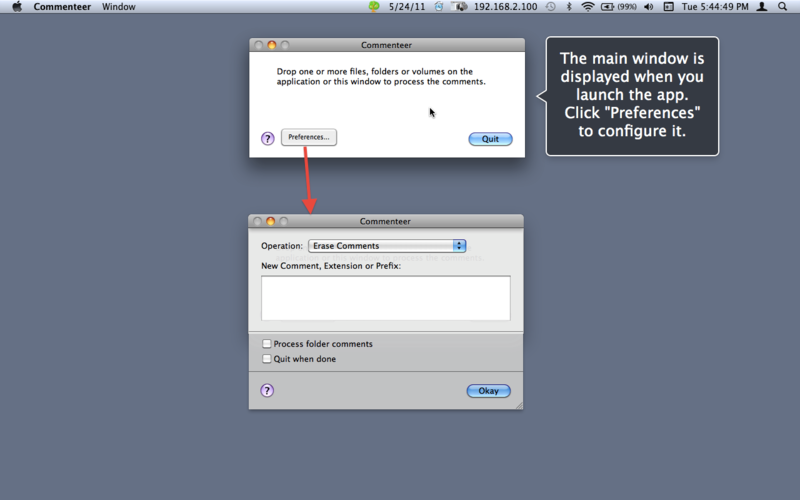 To use Commenteer just drop a folder or collection of files on it or the main status window. The main status window displays progress as it processes the comments. In particular the function performed is determined from the value selected in the "Operation" popup menu. • Erase Comments: Removes the comments from all the files. • Set Comments: Sets the comment of all the files to the text specified in the "New Comment, Extension or Prefix" field. • Set Comments From Clipboard: Sets the comment of all files to the text on the clipboard. • List Comments: Prints a list of the comments for each file in the Console log. When using this opertaion remember to include the files extension, which may be invisible in the Finder. Also, the name is case sensitive. • Append Comments: Sets the comment of individual files by appending the text in the "New Comment, Extension or Prefix" field. • Prepend Comments: Sets the comment of individual files by prepending the text in the "New Comment, Extension or Prefix" field. • Set Comments From Web Location: Sets the comment of a web location file (extension "webloc") to its web location URL. • Set Comments From EXIF Date: Sets the comment of a photo to its EXIF date.